Last weekend I had an artist alley table at GeekGirlCon in Seattle. Last year GeekGirlCon was my best show and this year was no different. 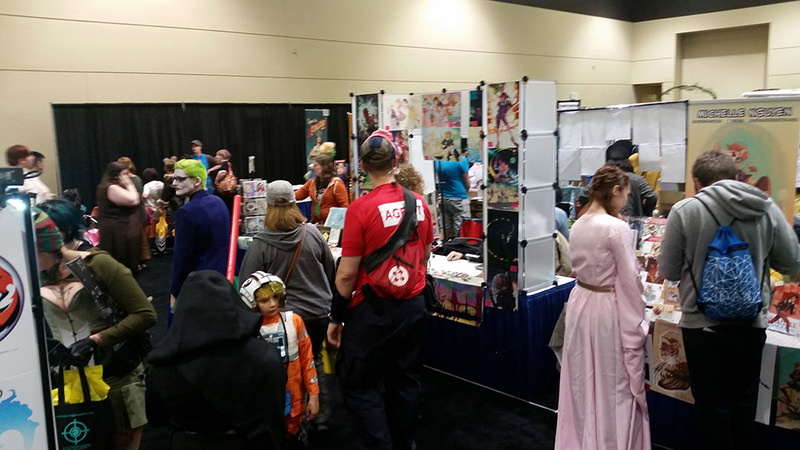 GeekGirlCon is like a comic con with a feminist/progressive theme going on. But there's still plenty of men who attend the show - I'd say the crowd was about 30% men, while most comic cons, in my experience, seem to be about 50% men. It's a small show, but very well-organized. What everyone kept saying - both attendees and fellow exhibitors - was just how exceptionally nice everyone was. There are also quite a few children who attend the show, and they are SO. CUTE. They're also remarkably well-behaved and intelligent. I had not one, but three little girls around the age of ten, who asked me if I work traditionally or digitally. When I said digitally, I was surprised when they asked for specifics about what programs and hardware I used. Then they told me about their projects and what programs and hardware they were using. Their dads would be standing nearby, smiling proudly. These two prints - "Imagination" and "Busyness & Inspiration" - really struck a chord with the attendees, particularly writers. 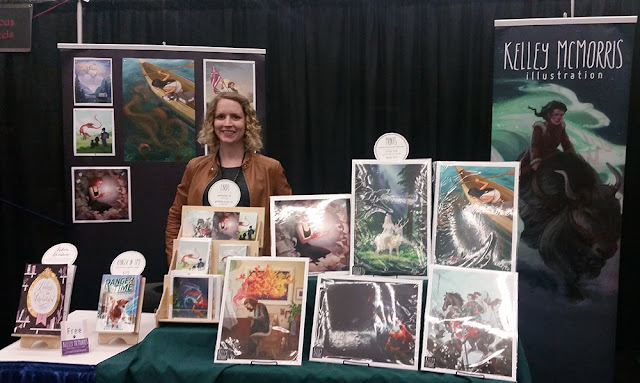 I had two different attendees visit my table and tell me that they had bought "Imagination" from me last year and proudly had it hanging right above their desks. One lady said that she had it hanging in her cubicle in the Washington State Department of Health. One woman walked up to my table and completely froze when she saw "Imagination." "Hi, how are you?" I said. She didn't move. "How's your morning going?" I tried. Again, she didn't move. I noticed a tear going down her cheek. "Uhhh are you ok?" I said. "It's just....this is me!" She said. "This is my space. My special writing space. The place where my children aren't allowed to argue with each other." She told me more about her special writing sanctuary, ended up buying both prints, and asked for a tissue. I'm often surprised at which of my drawings resonate with people and which ones don't. "Imagination" and "Busyness & Inspiration" sold out by the end of the con. I've decided that this con is going to be my last con - at least for a while. 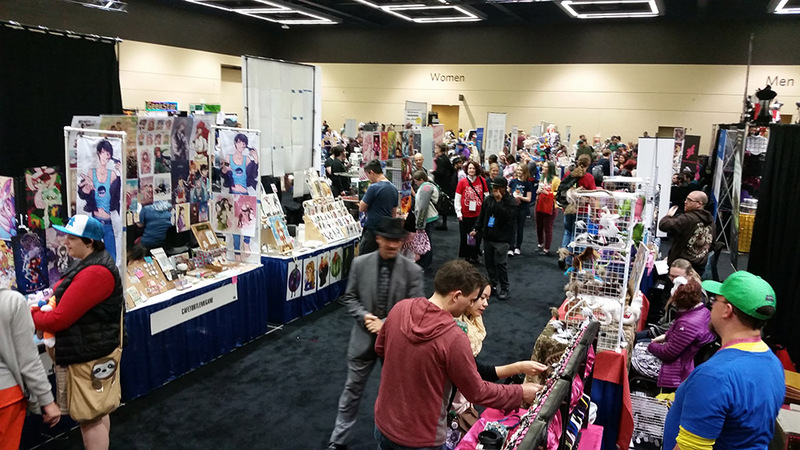 If all cons were as positive and profitable as GeekGirlCon, I'd happily exhibit at more. But too many of my con experiences have been disappointing. You never know if a show is going to be a good one or a bad one, and a bad show is really emotionally draining. It's hard to sit by and watch a steady stream of people ignore or reject your work for an entire weekend, knowing that you paid and prepped for weeks and mostly likely traveled for hours in order to do this. For the past two years I've tried to crack the con code and figure out how to make them more profitable. But I realized that it was taking away too much time and attention from freelance, which is much more profitable for me anyway. I will miss getting to meet fans and hang out with other artists after the show. I guess I'll need to find other ways of getting myself out of the house more often! 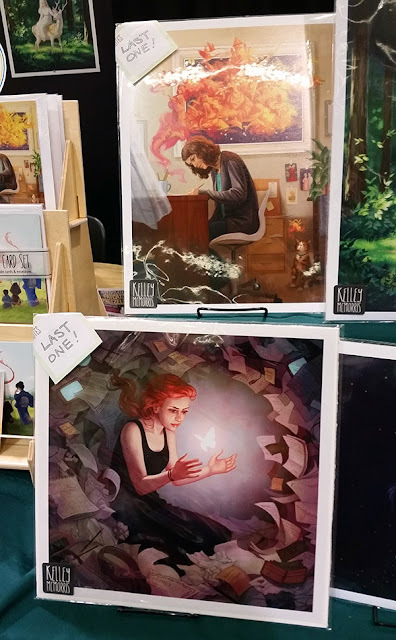 If you're interested in purchasing my art, I have some leftover prints, cards and postcards from the show in my Etsy shop. I also have prints in all sizes at my INPRNT shop. I've been having a weird year as I've been transitioning around, and looks like I might be transitioning again. I'll be cutting back on shows dramatically this year while I figure out what exactly I want to be using them for.